SAN FRANCISCO, Jan. 29, 2019 /PRNewswire/ -- Genesys® (www.genesys.com), the global leader in omnichannel customer experience and contact center solutions, announced its cloud sales have risen 32% year-over-year. The cloud business growth spans all market segments with 70% gains in the mid-market, 50% in small-and-medium sized enterprises, and 30% in large enterprises1. While sales are up across the company's cloud offers, the Genesys PureCloud® platform stands out for its hypergrowth with sales more than tripling since 2016. PureCloud's rapid expansion and impressive sales momentum blows peers away. 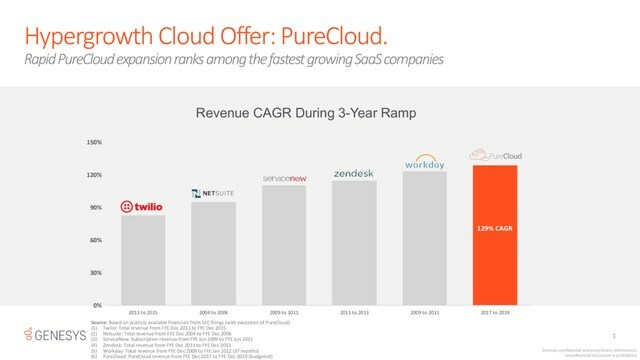 In fact, PureCloud has accelerated beyond the fastest growing SaaS platforms including Workday, Zendesk, ServiceNow and others2, with a projected annual revenue growth rate of nearly 130% since 2017. In addition, PureCloud's customers benefit from continuous innovation and the fastest feature velocity in the industry with over 300 new enhancements delivered in the last two years alone. In 2018, cloud deals valued at $1 million or more increased by 110% over the previous year. Many of these resulted from the Genesys PureBridge program, which has helped nearly 1,200 companies smoothly transition off of legacy systems from vendors including Avaya, Cisco and others to a modern customer experience platform by Genesys. One such customer is Alberta Treasury Branches (dba ATB Financial), the largest financial institution in Alberta, Canada. "For ATB Financial, the migration to a Genesys cloud solution is part of our customer-centered approach," said David Bradshaw vice president, ATB Financial Client Care and Sales. "It allows us to connect better with our customers, as well as improve employee communication, workplace planning and cost management." For the last two years, Genesys has closed more than three deals per day to replace an antiquated system from a competitor, with more than 700 coming from Avaya alone. Notably, more than half of all displacements moved to a Genesys cloud solution in 2018. The company's partners have been instrumental in driving this momentum. In fact, 86% of new logos were booked through a partner as channel sales grew by more than 250% over last year. "With hundreds of migrations from on-premises to the cloud, companies are flocking to Genesys because of our track record of delivering value and continuous innovation," said Paul Segre, chief executive officer at Genesys. "Our customers understand how intertwined digital channels, AI and the cloud have become – and they want to work with a strategic partner that can solve these needs holistically." Coca-Cola Business Service North America, the world's leading beverage company, reduced its total cost of ownership by 50%. Segre explained, "First and foremost, we understand that for our customers to excel in their markets, they need faster time-to-value. That means they need to innovate and adopt AI along with other new technologies, deliver better customer experiences, make their employees' jobs easier, increase sales, and reduce costs. With the cloud, we're enabling them to meet these goals faster and more cost effectively than ever." Find out more about Coca-Cola Business Services North America's journey to the cloud with Genesys. 1 Genesys defines mid-market as companies with under 3,000 employees; small-and-medium sized enterprises as companies with 3,000-10,000 employees; and large enterprises as companies with 10,000 employees or more.